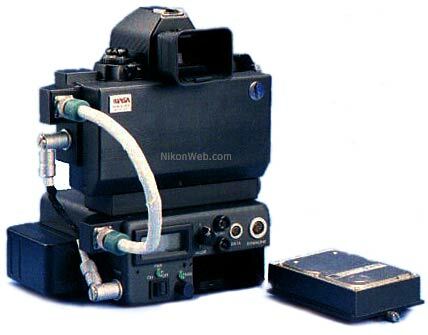 Being one of the first and rarest digital cameras ever, a modified Nikon F4 was first flown into space on board the Space Shuttle Discovery in September 1991, on mission STS-48. The standard Nikon F4 film body was converted to digital by placing a one megapixel monochrome CCD at the film plane. The sensor was a Loral CCD 1024x1024 pixel array with an active area of 15mm x 15mm. 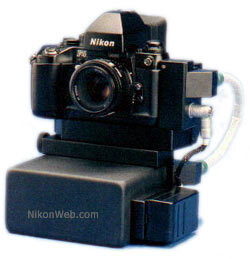 The battery-operated Electronic Still Camera (ESC) retained all the features of the F4 camera body and accepted any lens or optics with a Nikon mount. Nikkor lenses used on STS-48 included a 20mm f/2.8 AF, 35-70mm f/2.8 AF, 50mm f/1.2 and 180mm f/2.8 AF. Images obtained during the mission was monochrome with 8 bits of digital information per pixel (256 gray levels) and stored on a removable computer hard disk (see photo near bottom of page). The images could be viewed and enhanced on board using a modified laptop computer before being transmitted to the ground via the orbiter digital downlinks. The camera was later flown on several other Shuttle missions (including STS-45, STS-49, STS-53 and STS-56). Note that «Electronic Still Camera» is a generic description used by NASA for later digital space cameras as well, including Kodak DCS 460, DCS 660, DCS 760 and Nikon D1 models. Electronic still photography is a new technology that enables a camera to electronically capture and digitize an image with resolution approaching film quality. The digital image is stored on removable hard disks or small optical disks, and can be converted to a format suitable for downlink transmission or enhanced using image processing software. The ability to enhance and annotate high-resolution images on orbit and downlink them in realtime is expected to greatly improve photo-documentation capabilities in Earth observations and on-board activity on the Space Shuttle as well as future long-duration flights such as Space Station Freedom or a human mission to Mars. 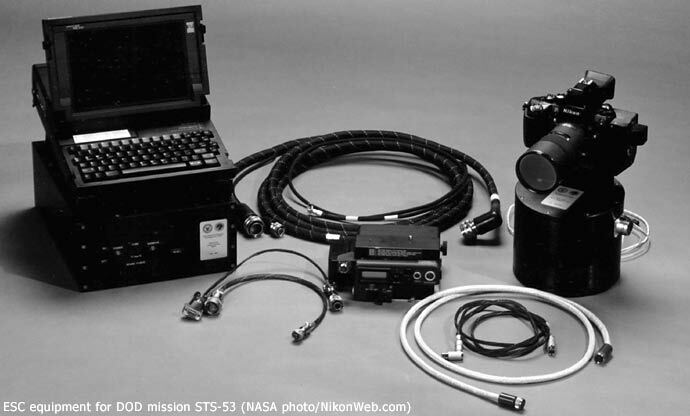 During the STS-48 mission, NASA will evaluate the on- orbit and downlinking performance and capabilities of the Electronic Still Camera (ESC), a handheld, self-contained digital camera developed by the Man-Systems Division at Johnson Space Center. The ESC is the first model in a planned evolutionary development leading to a family of high-resolution digital imaging devices. Additionally, through a Technical Exchange Agreement with NASA's Office of Commercial Programs, Autometric, Inc., Alexandria, Va., will assess the utility of the camera for commercial applications in close range photogrammetry, terrestrial monitoring and near realtime capabilities. The basic photographic platform is a Nikon F4 35mm film camera converted to a digital image storing device by placement of a 1 million picture element (pixel) charge coupled device (CCD) at the film plane. The battery-operated ESC retains all the available features of the F4 and will accept any lense or optics with a Nikon mount. 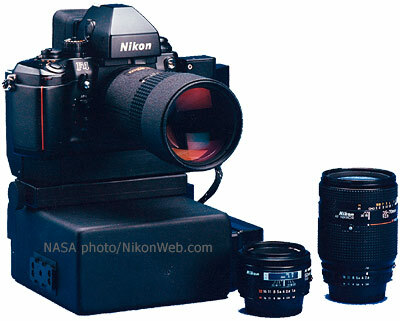 Lenses used on STS-48 will include the 20mm AF Nikkor, 35-70mm zoom AF Nikkor, 50mm f/1.2 AF Nikkor and 180mm AF Nikkor. Images obtained during the STS-48 mission will be monochrome with 8 bits of digital information per pixel (256 gray levels) and stored on a removable computer hard disk. The images may be viewed and enhanced on board using a modified lap-top computer before being transmitted to the ground via the orbiter digital downlinks. 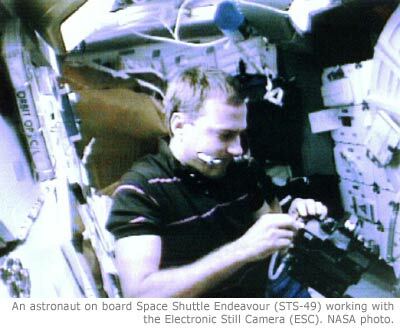 During STS-48, the ESC will be used to image areas of interest to commercial remote sensing users. Scenes of Earth, such as major cities and geological formations will be used to compare the ESC to other Earth-looking sensors. Images of Shuttle crew member tasks in the middeck and payload bay will be taken to test the camera's use for documentation and support to missions. Attempts will be made to collect stereo pairs at close and far ranges to test the camera's photogrammetric capabilities. In addition to imagery collection by the Shuttle crew, three ground-based tasks will be employed to demonstrate the advantages of a digital system. The first will provide hard-copy prints of the downlinked images during the mission. Upon receipt at the Mission Control Center, the images will be processed on a workstation and stored on disks for transfer to JSC's Electronic Still Camera Laboratory. There, the images will be processed by Autometric and printed with the 3M Color Laser Imager, an advanced 300 dpi color output device capable of printing over 170 photographic quality originals an hour. The goal is to have hard-copy images within 1 hour after the image is received in Mission Control. The second demonstration will be performed in conjunction with the Virginia Institute of Marine Sciences (VIMS). To provide additional imagery to compare with the ESC data, VIMS will conduct a simultaneous collection of imagery with an airborne sensor of the Colonial National Historic Park and the Middle Peninsula of Virginia. The third task will test the ability to respond to ad hoc imaging requirements which could provide critical support to management of natural disasters and other crises. After the mission commences, an area of interest will be named, it's location precisely defined and collection times identified. The imagery then will be downlinked to and printed at JSC. H. Don Yeates, Man-Systems Divison, Johnson Space Center, is program manager for the Electronic Still Camera. Jennifer Visick is the program manager for Autometric, Inc.
Hand-held Earth-oriented Real-time Cooperative, User-friendly, Location, targeting, and Environmental System (Hercules) spaceborne experiment equipment is a joint NAVY-NASA-ARMY payload designed to provide real-time high resolution digital electronic imagery and geolocation (latitude and longitude determination) of earth surface targets of interest. HERCULES system consists of a specially modified GRID Systems portable computer mounted atop NASA developed Playback-Downlink Unit (PDU) and the Naval Research Laboratory (NRL) developed HERCULES Attitude Processor (HAP); the NASA-developed Electronic Still Camera (ESC) Electronics Box (ESCEB) including removable imagery data storage disks and various connecting cables; the ESC (a NASA modified Nikon F-4 camera) mounted atop the NRL HERCULES Inertial Measurement Unit (HIMU) containing the three-axis ring-laser gyro. 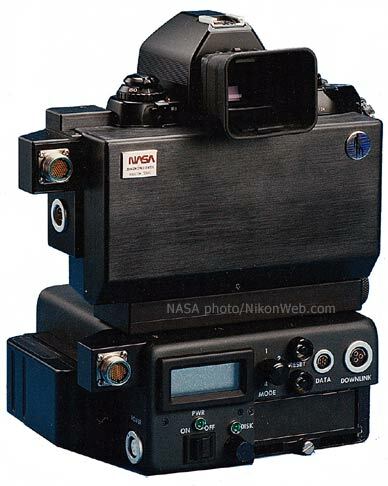 The HERCULES camera was flown on STS-53 Discovery, Orbiter Vehicle (OV) 103, Department of Defense (DOD) mission. CREDIT: The photos in this article have been provided by the Johnson Space Center in Houston, Texas. Some of them have not (as far as I know) been previously published on the Internet. A F4 ESC body was sold on eBay in September 2005. See the auction description and photos.